I ordered the switch on Amazon and selected the dimmable, non-scene one. They also offer dimmable, scene-capable as well as plain on-off types. They are available in paddle or (older style) rocker selections. The package contained the switch, an almond colored face-plate/trim, a neutral wire jumper, and a real set of instructions. 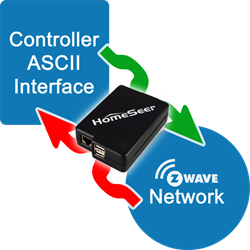 For a FULL REVIEW of the switch installation and integration with HomeSeer please refer to the attached PDF file. 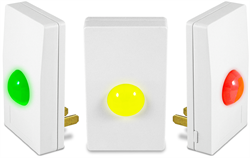 New Orleans, Louisiana, March 11, 2014 – Leviton announced today the release of an updated Vizia RF+ VRMX1 universal dimming switch. The new Z-Wave universal dimmer is the latest generation of Leviton’s Vizia RF+ family of Z-Wave energy management and lighting control products. Designed for the future, it supports the latest dimmable LED and CFL technologies, as well as legacy incandescent and halogen bulbs while incorporating the Zensys 4.5.4 Z-Wave library. The VRMX1 supports a universe of lighting applications including local and remote dimming control for incandescent, dimmable LED and CFL, halogen, magnetic low voltage and electronic low voltage. The highly advanced Vizia RF+ device provides two-way feedback, is scene capable, includes 49 different fade rates and features user pre-sets for powering on and minimum brightness. Featuring Leviton's Decora brand design, the VRMX1 blends into any home or apartment. The switches showcase innovative styling with a horizontal LED locator and brightness indicator bar. Additionally, two robust snap-in color change kit options are included for ultimate in flexibility and future proof design. The Leviton VRMX1 is universally supported by all security systems with Z-Wave energy management technology, including Leviton’s popular Omni automation systems. It is also optimized for use with Z-Wave door locks. For more information on the new VRMX1 dimming switch, visit www.leviton.com/viziarf. Trend Micro published a research paper recently, focusing on home automation and the potential security issues associated with these technologies. The paper focuses on X-10, Z-Wave and ZigBee (I guess UPB and INSTEON aren't popular enough, or are extremely secure). While there aren't any shocking revelations in this paper, it isn't a boring/long/dry document, so I encourage you to check it out if you have any interest in this type of stuff. There are few electronic boards that have gained as much attention and excitement as the Raspberry Pi. The little 35 US$ microcomputer is a quite powerful computing engine with very capable graphics engine and other multimedia IOs. Initially intended as a toy for newcomers to get into the PC development world, the Raspberry Pi has hit seven digit sales figure in short time and has become more and more a commercial platform further lowering the entry barrier for new embedded computing solutions. The next step in this evolution is called RaZberry. This enhancement kit for the Raspberry Pi turns the microcomputer into a fully featured controller for Z-Wave wireless smart home networks. Z-Wave is the communications technology used by the world’s largest ecosystem of interoperable devices for smart homes. This ecosystem has more than 750 interoperable devices from numerous different vendors across the world these products are listed at products.z-wavealliance.org,. RaZberry is a pan-European project, the company behind it - Z-Wave.Me is located in Geneva/Switzerland. The software was mainly developed in Moscow/Russia and the hardware is Made in Germany. The RaZberry solution comes in three parts. First, there is a little daughter board with the Z-Wave transceiver that plugs in the GPIO pin header of the Raspberry Pi board and not blocking the USB ports that may be used for other useful things like 3G uplink or WIFI sticks. Second, the daughter board holds the Sigma Designs Z-Wave transceiver with the licensed Z-Wave firmware managing the Z-Wave networking protocol. The third and most interesting part is Z-Wave middle-ware called Z-Way and is provided by Z-Wave.Me. –Z-Way comes installed on the Raspberry Pis SD card.. i. A single line of commands is all that is required to start Z-Way and start developing Z-Wave control applications. Z-Way implements all needed functions of a Z-Wave smart home gateway. It allows managing the network by including and excluding devices, ontrols actuators, reads sensors and connects all the dots together using direct associations between Z-Wave devices and/or executing scripts. commands in their web browser before uploading the code to the Z-Way server for automated execution. This command line operation greatly simplifies product creation. The complete system, daughter card with Z-Wave transceiver, Z-Wave firmware and Z-Way middle-ware sells at a recommended price point of 49 EU resp. 59 US$. Commercial projects with larger volume can expect discounts. All you need to add is a Raspberry PI and your creativity. The RaZberry is now available online e.g. at www.zwaveproducts.com. Further support and information including documentation, users forum and a news blog can be found at razberry.z-wave.me. This is an extremely good deal on a really nice Z-Wave controller. The cheapest NEW controller is the Vera 3 Lite, which runs $179. The Vera 2 is still a great unit (have one myself), so if you are just starting out, I would highly consider this one. micasaverdeshop is Mi Casa Verde's eBay account. I'll post more details as the alpha tests are conducted over the next months as appropriate. One intriguing new item was a window film that can be applied over an existing window, then have it's state change from transparent to nearly opaque (and back) with a Z-Wave command! This piece was mounted on a test window at the booth (as shown below). Here is a movie showing the film being controlled from is near opaque to clear state via a Z-Wave command. The near opaque mode blocks 75% of the light/view. The film can be cut to size and will initially be available in one by one meters and one by two meters. The control is via a Z-Wave power supply that causes the change of state to the film. The product should be available in a few months. Aeotec is also working on a totally blacked out version, dimmable capability, as well as one with a mirrored finish! The movie does not do justice to the coolness and wow factor that this product had!